Today's Christmas Giveaway is a split review and giveaway of Perfect Image 12 and Partition Commander 11. Both software programs are developed by Avanquest and serve different purposes. Perfect Image 12 is a Windows backup software that can be used to backup data efficiently, so that you can restore it at a later point in time should the need arise. Perfect Image 12 comes with all the tools needed to perform data backups and data recovery. The main interface displays a sidebar menu with the tasks and options provided by the program and a main area with information about the various hard drives on startup. The sidebar is divided into the categories Basic and Advanced Backup Tasks, Restore Tasks, Tools and News and Documentation. Each category can be minimized to safe screen estate. 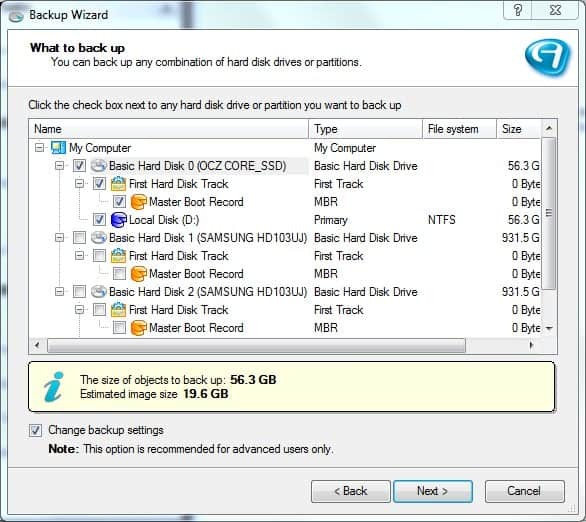 The Basic Backup Task category contains links to backing up a disk or partition, scheduling a backup or backing up files. A click on any of those will open a Backup Wizard that is guiding the user through the backup creation process. The screenshot above shows the first page of the disk and partition backup wizard. One useful feature of the program is that Perfect Image will estimate the resulting image size. This can be very helpful to determine the storage capacities that are needed to store the backup. Advanced settings like changing the compression level of the backup image, splitting large backup into files, password protecting backups or excluding files or folders from the backup are accessible by making a checkmark in the change backup settings option on the same page. The backup data can be saved to a local or network drive or burned to CD or DVD. The File backup wizard comes with additional comfortable options to use so called include masks to select specific file types from the selected folders that should be backed up. Four default masks are available including photos, video, audio and readable (documents) files. It is possible to create new include masks for specific needs, e.g. programming files. Another option are exclude masks that can block certain file types from being included in the backup; Again with the option to create custom filters. The Advanced Backup Tools offer differential and incremental backups on top of the basic backup options. Differential backups contain only the files and folders that have changed since the last backup. This reduces the size of the backup and the time it takes to create it. Basically a cumulative backup of all changes since the last backup. Incremental backups on the other hand will only backup files that have not been backed up before. Secure Partition - You can create a special secure partition on your hard disk to store disk backup images. Hard Disk Cloning - You can easily clone your old hard disk to deploy a new one, eliminating tiresome and time consuming operating system and application installation and adjustments. USB Recovery Media Builder - The Recovery Media Builder allows the user to create bootable recovery media on a USB flash drive, then boot the PC and perform any operations directly from flash drive in case of operating system corruption or boot problems. Blu-ray Disk Backup Support - Burn your backup archives to Blu-ray discs. A single layer disc can store 25 GB, more than five times the capacity of a single layer DVD. Verify Image Integrity - Verify the integrity of a backup. Create Recovery Disks - Create a recovery disk to restore a backup independently from the operating system. Restore Individual Files - Restore individual files from backups. Perfect Image 12 is a sophisticated backup software for the Windows operating system. Partition Commander 11 is the second program in this giveaway. It is - as the name suggests - a partitioning program for the Windows operating system that comes with additional cloning, migration and backup tools. The main purpose of Partition Commander is to create, resize, delete and merge partitions in the Windows operating system. Some possible applications include dividing a large hard drive into two smaller partitions or reclaiming unused disk space after deleting a partition that is no longer needed. What makes this product interesting however are the additional options that are provided. It can for instance be used to migrate data to a new hard disk that can be of the same or a different size than the original (the size needs to be larger obviously than the size of the old hard drive). System Back-Up & Restore - Partition Commander 11 now includes the ability to create a complete backup of your system before applying any modification/creation of a partition. Boot Manager & OS Installation Wizard - It’s never been so easy to install a new Operating System on your PC. Partition Commander 11 guides you through the entire process, even if one or multiple operating systems are already running on your PC. Partition Commander 11 is an easy to use partition manager that comes with several additional options and tools that aid the user in specific tasks that are related to hard drives (like migrating, cloning or installing a new operating system). Advanced users can switch to an advanced view that provides access to additional configuration options. Wow, this fine set from Avanquest would be one big step up the ladder for me, and would replace my EASEUS Partition Master and my Paragon Drive Backup 9. Please count me in! I have no software for backup (would be nice to have one) and what I use to manage partitions is Acronis DiskDirector. Yay, count me in, as well. I am using the Acronis disk director suite. v10.0.2160 right now but i am really want to give Partition Commander 11 a try. And i am using Acronis true image home v11.0.0.8027 but i am really wanting to give Perfect Image 12 a try. Its great to see you guys doing this generosity to poor souls like me who don’t have back-up , but want to have one. This would an ideal one if you oblige me! NOT A CHANCE FOOR ME? I am using Gparted and Acronis. I would be glad to switch to these products .Thanks. I’m currently not using any backup software. I hope to win Perfect Image license to start backing up my pc. I will be glad to get that. I would like to try this software. I do not have a good backup program and currently I am using EASUS partition magic for drive work. I’m currently using Acronis True Image Home for backup, but it has it’s shortcomings. EASEUS Partition Master is also in my collection, but I’d prefer these products. I’ve used other software from this manufacturer over the years and have been very pleased. I mostly use Drive Snapshot for imaging and Easeus Partition Manager for partition management. Thanks for counting me in. I use Acronis Trur Image & Easus. The use recovery option of Perfect Image is what I’m looking for. I typically use Paragon utilities for hard drive management, but would love to try these! Merry Christmas! I use SyncBack to backup a lot of files on an external hdd, but I need something better to manage my partitions! I’m using just windows 7 to partition and for backing up my drive which is very limited. I am very interested in trying Partition Commander especially! I’m using Cobian 9 and would like to try a more sophisticated backup. As always, thanks for being so kind and giving to your fellow Ghackers. Inned this software, please give it to me! For backup, I use DriveImageXML ; for partitioning, WinXP Disk Management. Better apps would be very welcomed. I am using Gparted to partition. My brother bought a laptop with 120GB HDD not partitioned so it would have been of great joy if I can win one license of partition commander so that I can help him solve the problem.i.e make more partitions for him. I need backup… I don’t have a backup or partition program. Thank you. I am using Microsoft SyncToy. I would like Perfect Image which provides compression, an easier restore, and (I hope) faster speed. I can definately use this awesome combination of programs to backup and partion my hard drives. Currently using EASEUS Partition Manager but I want to check this out. iI am using Parted Magic LiveCD and Windows Backup. Another great giveaway! Please count me in! Thanks guys! I got my operating system crashed recently and never ever got back my data..i really regret that why i didn’t backup my data and partitioned my harddisk timely ,may be i was not much more intrested in Vista’s default data backup utility..it would be a great software in my store if u would have one of the liscence for partition magic 11…so count me on.. I currently use Acronis TI . Would like to try this software. I am currently using Easeus Partition Master and GFI Backup 2009 Home Edition on my Vista Home Basic,however,Avanquest software is always of the highest quality so I am sure that Perfect Image 12 and Partition Commander 11 would be invaluable additions to any computer system.Excellent giveaways I would love to have! I use driveimage XL and the windows backup utility for backing up, and use disk manager in Vista for partitions. I REALLY need this. Currently, I’m using Norton Ghost but I willing to tried this out if I won the license. I’m currenty using the disk manager built in Windows 7 for partitions and the utility backup built in 7 for backup. Since, these are very simple and with few options,I would like to win them. well, at present i’m using the paragon drive… and the easeus part…,i think it will be good to try this and find out which one is better…. thanks alot….. I HOPE I CAN GET THE KEY! I have just started experimenting with Easeus Partition Master which has performed admirably except for one instance where I unknowingly chose the option to “erase all data” on a delete partition exercise, and it ended up taking 8 hrs..
For Image backup, I use Lenovo Rescue & Recovery…. I am a great advocate of image backups and recently bought a 1.5TB external HDD just so I can make many many of them… Plan to experiment with various Image Backup programs soon and would like to try Perfect Image 12 as well as Partition Commander 11. May I have the licenses please? It would be great to win both these utilities. I have moved to Win 7 and would like to replace my Acronis Disk Director 10 and Acronis True Image 2009 which is not compatible with Win 7 . No updates for either. What is up with that ? Thankyou for the Great Offers ! My software for backup is delivered together with Samsung external hard disk, which backups my data at the certain time once a week. I also use Norton Ghost to quickly restore my primary partition with the fresh installation of Windows XP, drivers and software needed. I do not use any specialized software for partitioning, just built-in Windows mechanism. I used to use the win98 bootdisk, but it only support FAT. When I switched to XP pro I use the XP cd to format to NTFS, when I need to start a clean install of XP. Then when I need to add a new harddisk to a running XP, I format the new harddisk in the “Disk Management”-tool. This is all i’ve needed so far. I got an old Paragon Drive Backup 8 Special Edition. If you like the GUI from the screenshots, then go for the free Paragon Tools. I think they look the same. Yes! I need Perfect Image and Partition Commander. I currently use the Paragon products and I am not happy with them. Either of these softwares will be nice to have. Both seem pretty handy tools to me! I hopw I win, I’m in. I hope I win, I’m in. Perfect Image 12 and Partition Commander 11. Sounds interesting, never heard of these two before. For the moment I’m useing Easeus Partition Master together with Windows own invention for dealing with partition’s. It was a quite long time ago I left my trust in Windows System Restore function for resque operations. Imagine it’s more safer use other software for this reason..Then it sounds more tempting makeing Clone’s and image’s instead as backup. Easy effective solution’s is never wrong! Not using any backup software at this time, and for partitioning I hardly ever do this. But the backup solution sounds nice. I am not using anything to partition or back up files. Hello, I am using right now the free partition manager pro from Easeus and free true image from Seaggate. pls consider me for this contest. Hey, I use no partition manager nor any back up systems at this time. I need this. thanks. Please count me in for the December 11 giveaway! Some years ago I tried many products for disk partitioning. I has stopped on VCom Partition Commander as the best utility that has never corrupted NTFS (or even FAT32) on our servers in the company when electrical power has been unstable. Now in 2009 the old version of the software that we are using is still much better compared to newest products of other companies. I so like Partition Commander that have decided to win a license. I have never asked Ghacks for licenses and I would be very appreciate you if I win a license for personal use. This is wonderful software! The best! I’m currently using GParted Live. I need this. Currently using a very old copy of Acronis image, and nothing for partition managing. thank you so much for this new giveaway and for you excellent reviews. I use Paragon Partition manager and Macrium Reflect free. I wouldn’t mind to win a free copy fof Perfect Image. Hi, I currently don’t have a partition or backup software, but I hope I win one so that I can backup my files. Thank you Ghacks and Avanquest ! Avanquest, like some other companies, seems to repackage products from other software makers : I don’t know if I am right, but at first sight it seems that the actual Avanquest product is in fact a Paragon’s one. I really needed a good imaging software. Strangely, somehow I couldn’t get Windows Seven’s system backup function to work for me. Am I the only one who finds Backup Software confusing? and yes that means I’m not running any so with the Windows backup switched off…. I’m naked so to speak if I have a crash. Would not mind giving this one a try. hope gt a chance to backup my notebook data here..
For partitioning I use Gparted live cd and Partition Manager, for backup use Titan Backup, Macrium Reflect and Karen’s Replicator. Thanks for the giveaways. No backup software. But for partitioning – Free Partition Manager. Well, should be worth trying. I’m currently using Acronis True Image 11. Now here’s a Giveaway I’ve been waiting for! I had to give up on my old Partition Manager because it wasn’t working on newer/larger drives so I’ve resorted to GParted and other Linux variations for partitioning and DriveImage XML for my backups/imaging. My last purchase for this type of software was (Symantec ) Ghost v9 I think. I was sad to see it become a different type tool than it had been and quickly removed it. I purchased both of these products back when I was always tweaking. building, and constantly upgrading my computers but haven’t updated them in many years, but my systems have remained pretty unchanged until now. The kids are making me the PC guy again and these tools would certainly help me get past our overpopulation boot partitions and allow me to configure some good dual/multiboot systems once again. Thanks for the chance at winning such great products! For Partitioning I currently use the windows internal tool. For Backuping Acronis an old version. This is very good soft for me. Thanks. I have several Avanquest products and have been satisfied with their functionality. These two products seem to be just what I need to round out my needs. Thanks for the opportunity. I use Gparted for partitioning but no backup software. I would like to try these. Just using Windows. This tool would help. Count me in. Can you please count me in? Perfect Image 12 ? From Avanquest ? I’m not using anything to back up files. YET! count me in and currently i’m using paragon partition manager and acronis true image home 2009. I currently use EASEUS Partition Master and Paragon Drive Backup 9. This would be great to give it a try with these softwares! Count me in!!!Thanks. ooh! ooh! Gotaa win one! Seagate DiscWizard works only with Maxtor and Seagate disc drives (powered by Acronis). DiscWizard install your new disc drive (with wizards), creating and formatting partitions, transfering data, and backing up data. Nice one. count me in please. I currently use pargagon hard disk manager for both partioning and back. I would like to compare your what is offered today with what I use now. I’m still using a Super old copy of Partition Magic, which is only XP compatible… I’ve been using GParted and DriveImage XML, but neither of those suit my needs… Partition Commander sounds great to image and clone disks! I’d like to check it out! Be verynuseful as I do not use any. Your description justifies its usefulness and if am lucky, ownership! I use StorageCraft (Shadow Protect) which has impressive features., but am looking for something different on one of my other PC’s. It is not good to put all your eggs in one basket. I use the built in microsoft partition manager and the automatics restore points in windows 7. I’m using Terabyte Unlimited Image for DOS. Would love to use Perfect Image and Partition Commander as windows solutions. Thanks! I’m using Paragon Partition Manager and no back up one. I don’t use any backup or partition software. I do optical backups with nero. Let me try out this plz by winning it. Hey please give me one license!! I currently use Macrium reflect free..
Acronis here.. Pretty good too…. Got to try this! Count me in. I am looking for a best partition manager and am also searching for a free backup tool. This giveaway is cool. Count me in. Nothing and have backed-up diver using an external hard drive. If possible count me too. Thank you. Plz give me . . I currently use old versions of Acronis True Image and Disk Director. I’m currently using System Commander for partitioning. I believe this is the predecessor of Partition Commander. For backup I use either Retrospect or Drive Image. Unfortunately Drive Image was bought and then killed by Symantec. I currently just use the native capability of Windows XP/Vista/etc. to allow for mutliple OS. It would be great to be able to have Linux/OpenSolaris and even Win98 for some old apps. As far as backups, same thing. Native Windows backup utility, which is severely lacking on Vista in my opinion. At the moment I’m using Partition Magic and Norton Save and Restore. Multi-boot software does not work in Windows 7 or Vista. . . . If it works, I will be very surprised. Please count me in. I use Drive Backup 9.0 Personal & Partition Manager 9.0 Personal at the moment. I would be great to grab on of them. Thks.